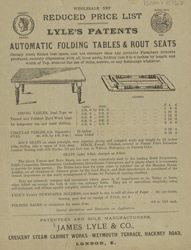 This is an advertisement for Lyle's portable folding tables. Towards the end of the 19th century lots of cheaper furniture made from soft woods were sold by retailers to the middle classes. A table like the one featured in this leaflet would have been very useful, it could have been used as a coffee table in the parlour, as a table to eat off in the breakfast room and even to write on in a study. Because the legs of Lyle’s table fold down it would have been useful in smaller homes where it could be used and then folded up and tidied away.